Funded or bootstrapped, start-up entrepreneurs who have been able to survive the basic proof of concept stage to their passion, start focusing on ‘viable scale-up’ through aspects, such as building scalable processes, technologies and organization structures. Till they overhear a coffee conversation with some voices and murmurs, such as, “The company is no more the same. I am not sure if I want to continue here anymore!” And if this is from one of your top talents, it suddenly highlights critical intangibles like the firm’s culture warranting attention. Here are the tips for a growing firm to ensure that the start-up culture is not lost. Managing business operations effectively in the dynamic environment is challenging even in the best of times. Companies grapple to grow in an ever competitive environment, changing government & regulatory needs and emerging technological innovations. To sustain business growth, they try to balance the external changes through development of new skill sets and knowledge. However, the struggle remains to make necessary and immediate changes both internally and externally to remain profitable. Helping to counter such uncertainties to business growth, BMGI - a global consulting firm, headquartered Longmont, Colorado, US, partners with organizations at various stages of their business life cycle to transform and enhance business performance. The company enables businesses to Innovate, Strategize and Solve Complex business problems. 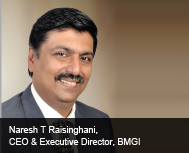 “Effective strategy consulting is about helping the client’s leadership team think through their aspirations, gaps that exist in reality and clearly articulating the way forward”, says Naresh T Raisinghani, CEO and Executive Director at BMGI. The domestic automotive industry has been in the doldrums for the last year and a half, with the commercial vehicle sector being one of the worst hit. Despite the challenging times, the results of the recent Lok-Sabha elections have brought about a thorough change in sentiments with hopes of a market recovery towards the end of the current year. The recent Noppen CV Summit held in Pune brought to light the views and suggestions of industry leaders about market trends, growth prospects, upcoming technology, etc. Given below are the highlights of some of the presentations made by them. One of the first shifts in source of energy that revolutionised manufacturing was the popularisation of steam engines over wood and coal. The second significant shift occurred when the factories moved to electric power. Even though the first electric power plant which could supply electricity over a distance was established by 1880 in the US, it took over half a century for electrification to become a way of life for factories, with one of the first plants in US being electrified in 1920.